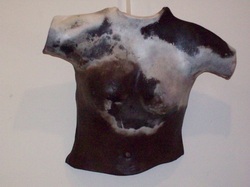 Pit fired female torso made in white stoneware clay then fired with gum tree and wattle timber, woodshavings and organic matter. Approx 45cm L x 47cm w. NFS. Photo by artist. Pit fired orbs made in found clay with slip covering, burnished then fired with gum tree and wattle timber, woodshavings and organic matter. Approx L 15cm h x 13cm w, S 12cm h x 8.5cm w. Photo by artist. 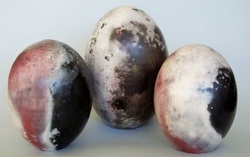 Pit fired eggs made in white stoneware clay, burnished then fired with gum tree timber, woodshavings and organic matter. Approx L 17.5cm h x 13cm w, M 14cm h x 11cm w, S 13cm h x 10cm w. Photo by artist. 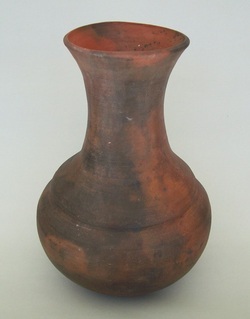 Pit fired vessel made in found clay with terra sigillata covering and fired with gum tree timber, woodshavings and organic matter. Approx 28cm h x 18cm w. Not waterproof. Photo by artist. Pit fired form made in white stoneware clay and fired with gum tree timber, woodshavings and organic matter. 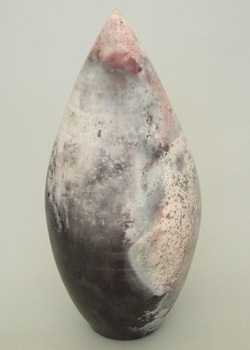 Approx 26cm h x 12cm w. Photo by artist.